Six-Car Pub & Brewery is the latest shiny new eatery downtown. There’s an energy about Six-Car Pub & Brewery. Modern lines, steel and natural wood invite you in, and large windows looking toward some of downtown’s taller buildings give you a new sense of downtown Amarillo. A very urban sense. Six-Car occupies one half of the newest building on Polk Street at Seventh Avenue. Crush Wine Bar and Deli should open in the other half in the near future, having moved from its original home across Seventh. My husband, Kevin, and I ventured to Six-Car this week and zeroed in on the tapas menu. Tapas allow you to try and share a variety of small plates. It’s how we can learn a lot about a restaurant’s menu in one sitting, and we love that. 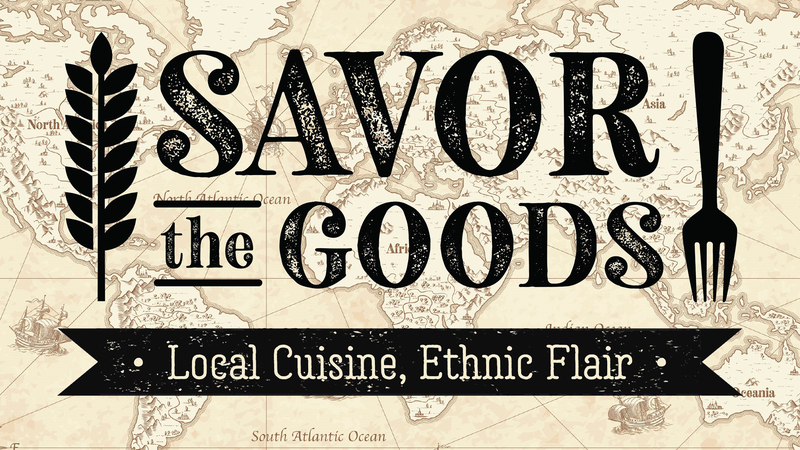 This menu is wonderfully eclectic — elevated tastes with mostly Asian influence served up by Chef Scott Buchanan and his crew. The Green Papaya Salad is a happily light mix of fresh greens and herbs, plus green papaya and a nam pla, or fish sauce, vinaigrette. 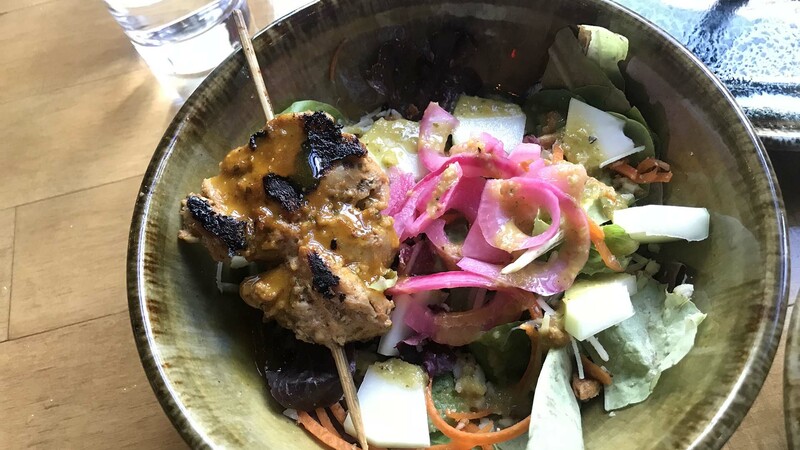 Pickled onions and a chicken hibachi skewer add to the mix of flavors. From the tapas menu, we selected three options: Bulgogi Sticky Rice, Shaved Local Squashes and Smoked Chicken Karaage. 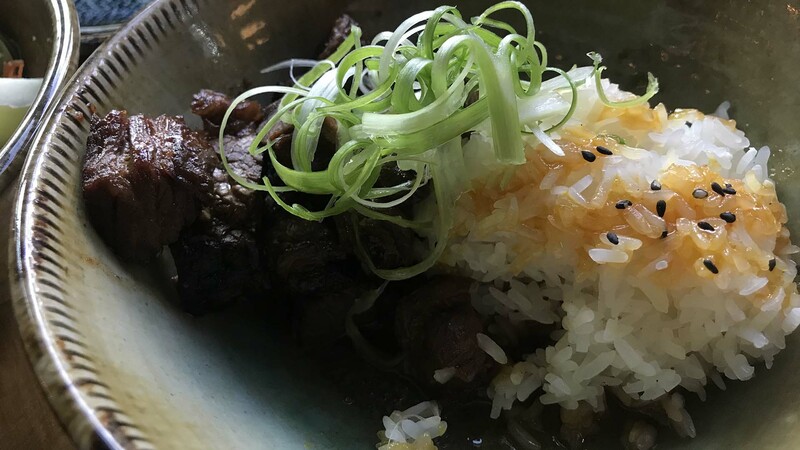 In the bulgogi, flavorful marinated chunks of beef combined beautifully with the sticky rice and mango chutney and chili oil in the bottom of the bowl. 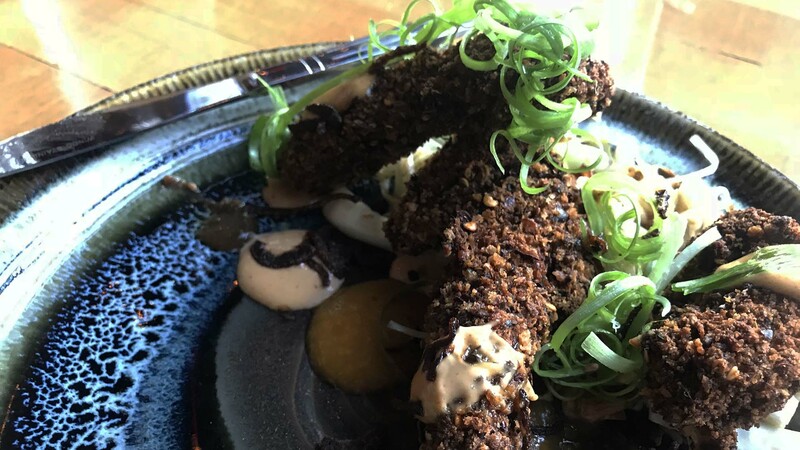 The chicken pieces in the karaage carried a crunchy crust of smoked bread crumbs and the dish was finished with a triad of flavors: a charred tomato chutney, Alabama white sauce and an apricot puree. They made such great bites with the chicken that I will order extra amounts of each when we have this tapa again. A little was not enough! But the squash was the omigosh of our first outing. 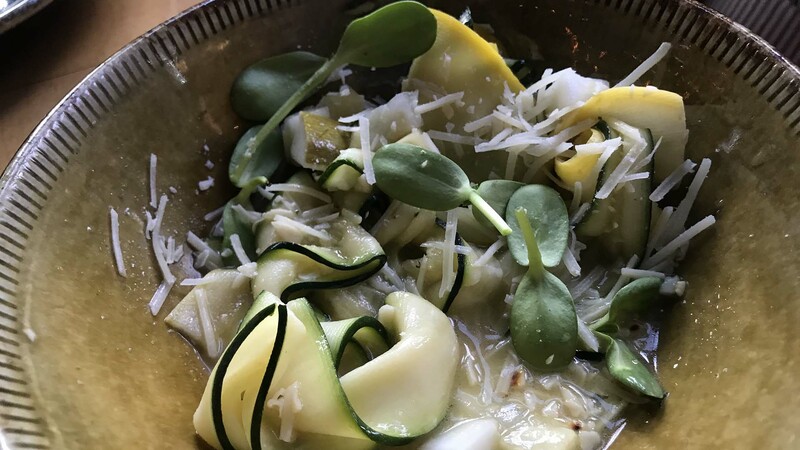 Long ribbons of zucchini and yellow squash are folded delicately into a local herb oil and chopped herbs. Peanuts and shallot provide an extra nuance. The dish is so light, it’s airy. 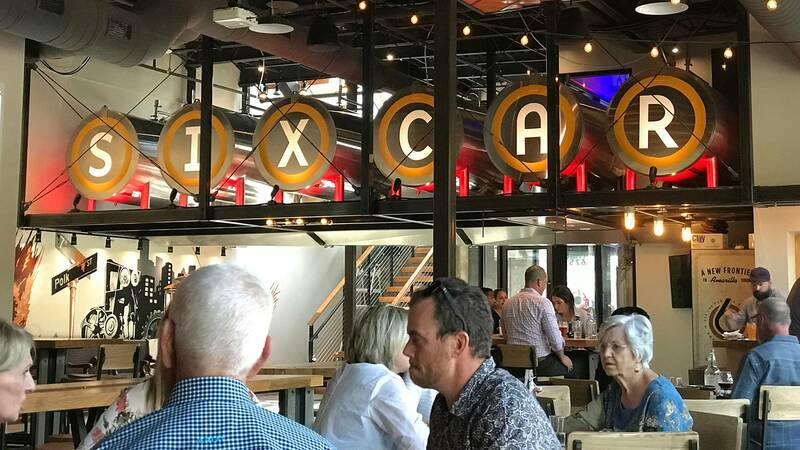 Of course, Six Car is a pub and brewery. So we sampled a variety of beers. The list gives any beer lover an chance to find one that really hits the spot. The menu includes more than tapas. A “butcher block” section features burgers and sandwiches with unusual twists, other salads and appetizers, three sides and a trio of dessert options. We appreciated the friendly, personal service, especially during the initial days when new restaurants in Amarillo are crazy busy. Many diners took advantage of nice weather and sat on the patios at Six-Car. If you go to the rooftop patio, be aware that there’s a limited menu there. 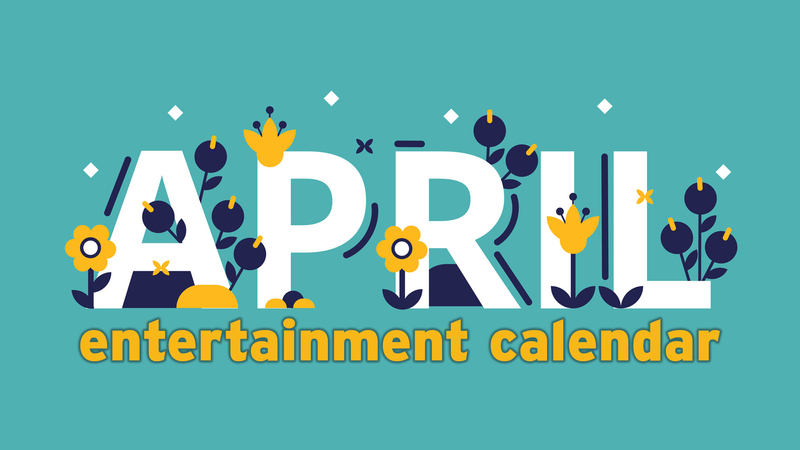 The ground-floor patio offers additional amenties: disc golf and a stage for entertainment. Karen Welch is a senior content producer for Panhandle PBS. She can be contacted at Karen.Welch@actx.edu, at @KWelch806on Twitter andon Facebook. Subscribe to the Panhandle PBS BizHere podcast on iTunes and SoundCloud to hear more business news and interviews.